On Tuesday night Stephen Colbert opened The Late Show by cracking jokes about Kendrick Lamar's Pulitzer Prize success and the fate of Wu-Tang Clan's "lost" album. For those who don't know, Wu-Tang made just one single copy of Once Upon A Time In Shaolin and auctioned it off to the highest bidder. Unfortunately, the album was bought by pharma-douche Martin Shkreli who promptly had it seized from him by authorities when he was sent to jail earlier this year. It is now in the hands of the Justice Department with nobody really knowing what will happen next. 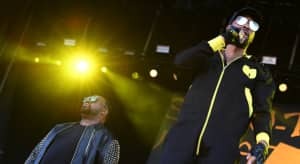 Colbert introduced Method Man and Ghostface Killah to the stage to talk about this, setting them up for a comedy bit where they argued with Attorney General Jeff Sessions about the fate of their music. Naturally, Sessions was not actually there and was, instead, represented by a cookie. Check out the footage above. During the same episode Colbert sat down with former FBI Director James Comey for an interview about his new book and being fired by Donald Trump. This led to a backstage area that was filled with both two Wu-Tang Clan members and a man who had to speak to the President about a pee tape. Enjoy that sight below.